Earlier this year, when Kevin from Fountain Pen Revolution (www.fountainpenrevolution.com) released his latest offering – the ‘Indus’ – he disclosed on his website that another pen (the ‘Jaipur’) would soon be on the way. A couple of weeks ago, it finally ‘launched’ – and as soon as I knew it was on the market, I placed an order. I’ve reviewed a few FPR pens (and pen pouches) before today, and received a couple of Indus pens for free in return for a review. This time around, Kevin kindly sent me a second ‘Jaipur’ (at his own initiative), to allow me to give a more comprehensive review of the options available. So, full disclosure up-front: I paid for one pen, and received two – but have no affiliation with FPR, and have not been compensated for this review. Another comment up-front: one of the reasons I was so keen to review this pen is the fact that this is the first FPR pen that has been designed from scratch by its proprietor. Most other pens (the Guru and the Indus, and I think also the Dilli) were adapted from existing designs by other manufacturers. I’m a fan of the (comparatively) low-cost options provided by FPR, and especially excited to see this pen finally arrive on the market. This review is necessarily provisional – I’ve only had these pens for about a week at this stage – so please bear in mind, I can’t speak first-hand as regards its durability. The Jaipur is available in two ‘versions’ – a ‘standard’ version (if I can call it that), and a demonstrator version. 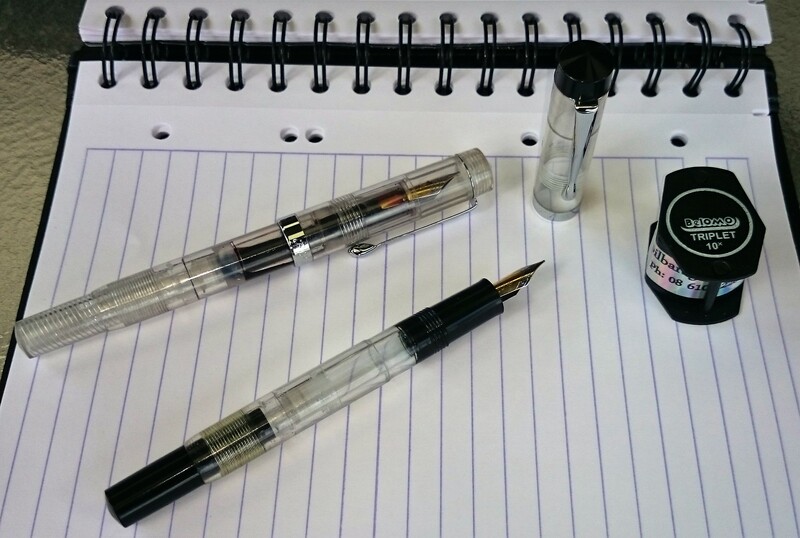 I ordered a clear demonstrator, with a 1.0mm stub nib; the additional pen Kevin provided me with was a demonstrator with black finial, grip section and piston knob. Like most of FPR’s offerings, the Jaipur is a piston-filler pen (more on this later). The pen is designed along fairly straight lines – there is no taper to the cap or to the barrel (along most of its length). The top of the finial rises to a point, while the bottom of the piston knob is curved – but most of the rest of the pen is ram-rod straight. The barrel is just a little thinner in diameter where the cap fits over it, and has a slight ‘step-up’ beyond that point. I like the way the end of the barrel tapers down slightly to accommodate a narrower piston knob, which make it easier to post the cap deeply and securely onto the rear of the pen. Whatever version of the pen you buy, the ‘accents’ (cap ring and clip) are ‘chrome’-coloured stainless steel. 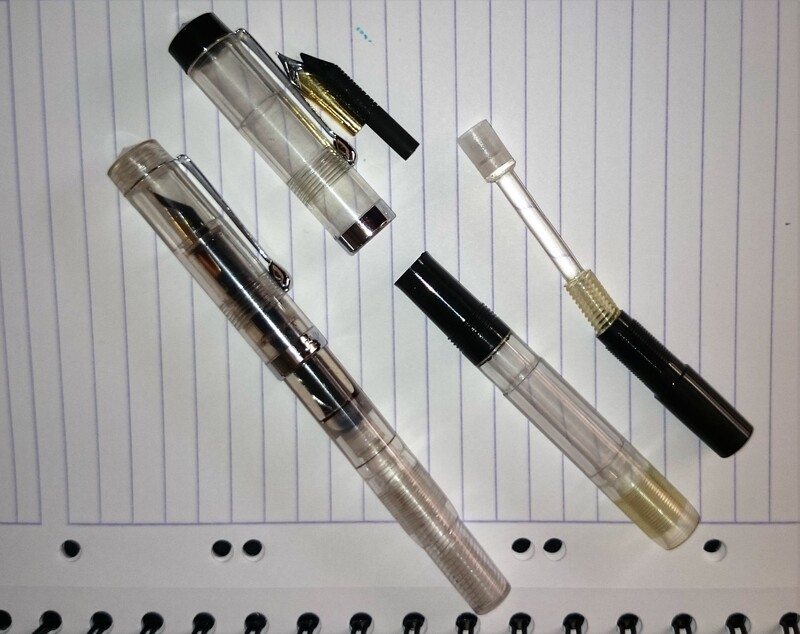 If I had my time over again, I don’t think I’d order the clear demonstrator – I bought it because I thought it would be easier to see how the pen fit together (which it is), but the black-demonstrator pen Kevin provided me with just looks a little classier (it reminded me a little of my black TWSBI Eco), and the ‘solid’ models look pretty good too. The Jaipur is moulded (primarily) from the same vegetal resin as the Guru – which is less glossy than the plastic of a TWSBI Diamond 580 or Eco, but also less brittle and prone to cracking. It feels sturdily constructed to me, and the tolerances on the threads seem pretty tight. These pens are very easy to assemble and disassemble: the nib and feed are friction fit into the grip section; the piston filler mechanism is similarly easy to remove for cleaning and re-greasing. 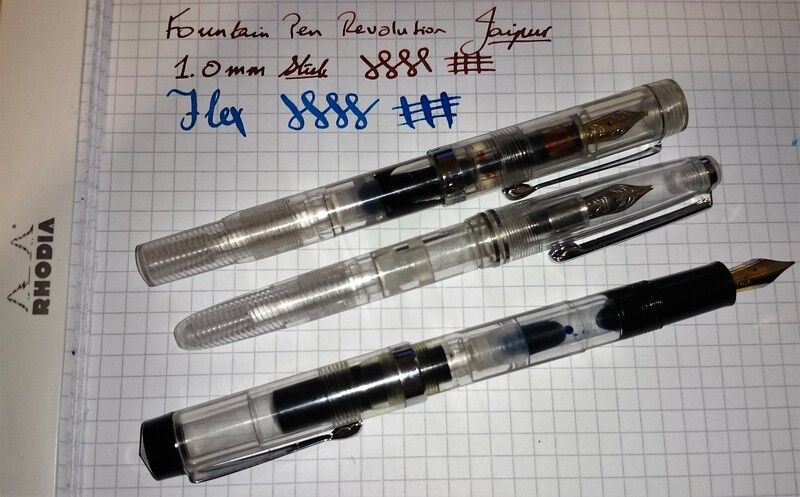 I’m a great fan of the FPR Indus – it’s a stylish looking pen, that reminds me of the Pelikan M200 (and is probably the closest I’ll come to owning one!) – but it’s not a big pen. The Jaipur feels a little more substantial in the hand, and there’s a reason for that: the grip section is 12mm on the cap thread (where I tend to hold it) and 11.5mm just beyond the thread, tapering down to 10.5mm at its narrowest. The cap band, the widest part of the pen, has a 14mm diameter, while the barrel sits around 12mm. Lengthwise, the pen is 136mm long capped, 126mm uncapped, and extends to ~155mm posted. It weighs in at 17g (11.2g uncapped), which makes it a fairly light pen, but its added girth was something I really appreciated. 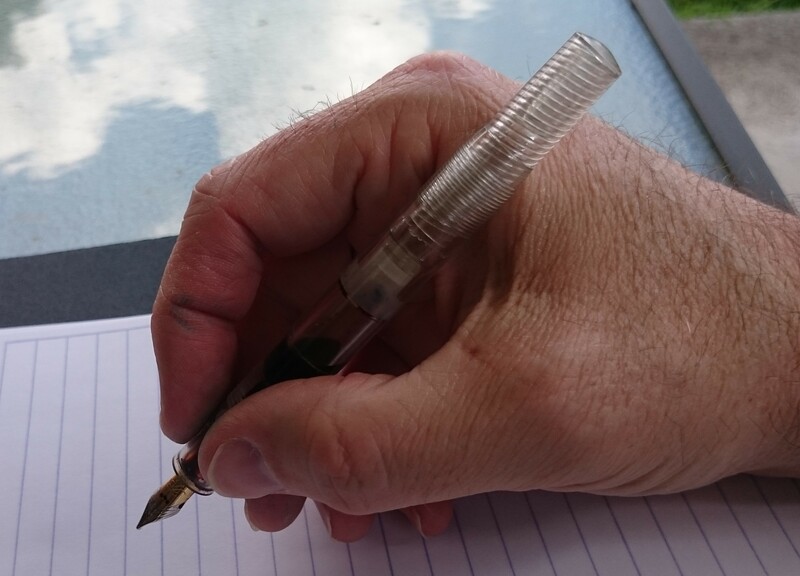 The pen sits equally in the hand posted or unposted – and I didn’t find the presence of absence of the cap shifted the weighting significantly while writing. The Jaipur is designed to take the #5.5 nibs that have been available on FPR for the past year or so, married to an ebonite feed – and this, to my mind, is one of their greatest strengths. The #5.5 nibs across the range look attractive and write smoothly – and the ebonite feeds provide a very generous flow of ink. Additional nibs and feeds can be purchased separately at a very reasonable price (I ordered an additional flex nib/feed combo for$8), and as I mentioned above, they’re very easy to swap in and out. If you check out the website you’ll notice that there are two types of 5.1mm feeds available for these pens – the standard ebonite feeds, which “are pretty wet offering a generous ink supply”, and the flex ebonite feeds (“Caution: this is a very wet feed!”). The Jaipur is a piston-filler, like most other offerings from FPR (the Triveni being the exception). I’ve expressed my dislike of the Dilli several times in the past – I don’t like the fact that that the piston is permanently fixed in the barrel, making it hard to clean the pen thoroughly – so it was a relief to discover that the Jaipur is easy to disassemble. I’ve read some recent comments on other FPN threads, from people who had problems with the piston seals on the FPR Guru (and some of the Serwex pens) being prone to cracking – I haven’t experienced this myself, but was conscious of the concern as I checked out this pen. A side-by-side comparison showed that although the Jaipur piston head is made from the same kind of material, it’s a little wider, and appears somewhat sturdier. The Guru piston was too small to make contact with the walls of the Jaipur, so it appears that the piston mechanism has been custom-made for this pen. The wider bore of the barrel is also reflected in its ink capacity – I was able to syringe-fill it with 1.5ml of water. The Jaipur is great value for money, at $18 per unit (add $3 if you want a B, stub or flex nib), plus $3 postage per order. FPR’s #5.5 flex nibs are top quality for a bargain basement price, and married with an ebonite feed in this pen, you’re guaranteed a very wet, very enjoyable writing experience. 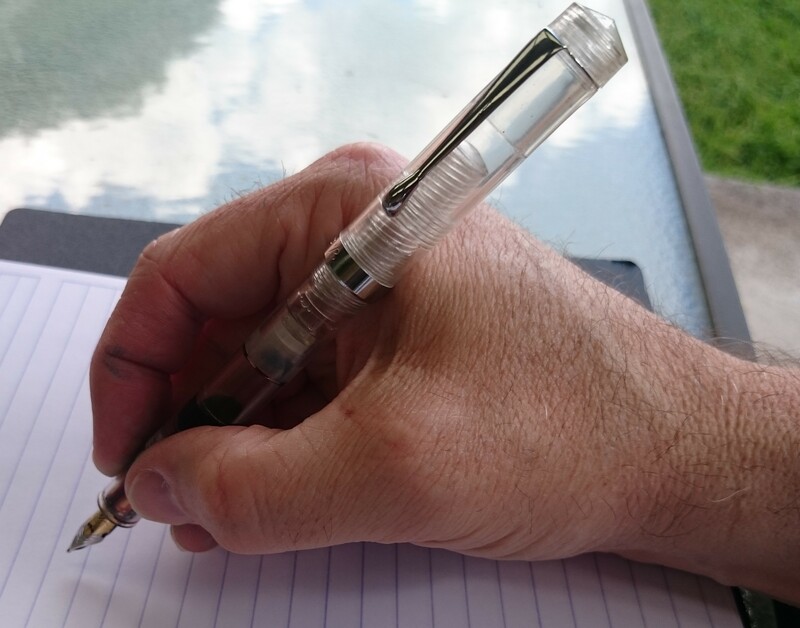 I’ve been a fan of FPR from the time I bought my first pen from them, nearly 2 years ago – and this pen is another example of their commitment to provide good quality (fountain pen) writing tools at very affordable prices. @FPGal,thanks for the compliment! I should mention, the FPR website is still advertising a "buy one Jaipur, get a Guru free" offer for the first 100 orders. The Guru is, in my opinion, a pretty good low-end pen - we'll worth its regular price of $9,even better value when you're getting it free! Great review! I ordered the Jaipur in black with the flex nib. I'll drop a note here with my observations after I receive it. My usual personal gut reactions are based on aesthetics and feel in my hand and not near the level of your educated reviews. Glad to hear it! I think what makes FPN such a useful resource is that people can add their feedback to the original review, either to reinforce or to contradict it - and to give a broader range of perspectives. My preliminary take: I find the Indus more aesthetically pleasing, but prefer the more substantial 'feel' of the Jaipur in hand. If I had a 'solid' pen rather than a demonstrator, I might think differently though - which makes me all the more interested to hear your thoughts! I just received mine this morning! - will write comprehensive thoughts when I have a moment. I'm generally very impressed but am having some trouble with the nib (I ordered a flex nib) - it's very stiff and scratchy, to the point of gouging the paper when I try to flex it :S Wondering if I got a bad one, if I should contact FPR or what! I also got a clear demonstrator, because the only other demonstrator I have is terrible. I got a free pen (presumably a Guru?) along with it too. I received mine with an EF nib (with a corresponding Guru in EF) and I must say that I am not so impressed. Both had a very strong smell of plastic which I still cannot get rid of. If anyone knows how to get rid of the smell, I am all ears. The Dilli and Serwex which I received a couple years ago were, at least, free of the smell. I gave the Dilli away to a student of mine and the Serwex broke within a week of its arrival. So I was not impressed by those either. The main issue I have with the Jaipur is that I need to increase the ink flow. I will try out the method on FPR's website but out of the packaging, the pen, using Waterman black on Rhodia would not write on any upstrokes. The Guru, on the other hand, writes fantastically but its more expensive cousin falls flat due to the poor ink flow. At this time, I can't say if its an issue with the feed, the nib or simply a quality control issue. Aesthetically, the Jaipur is a very nice pen. I love flat tops more than cigar shaped pens. 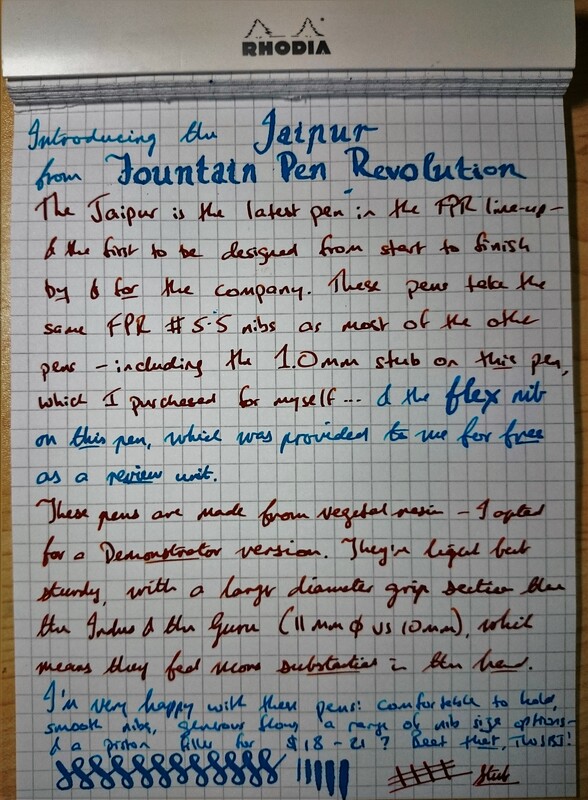 I want to like the Jaipur but with the pervading smell of plastic and the poor ink flow, it is not doing very much to improve my opinion of the FPR range. Edited by Bounce792, 22 September 2015 - 16:31.
ah, a Serwex - that's the name on the spare pen I received! Unfortunately mine also smell rather strong but I assume it will fade in time? A couple of things to try before contacting FPR: first, remove the nib and feed,see if you can realign them to each other, and reinsert. Second, check the tines (do you have a loupe? ), make sure the tines are lined up well. Third, though this is less likely to be the problem, check out Kevin's (FPR's) video on heat setting the nib and feed. My flex nibs from FPR have generally been smooth on arrival, so it sounds like you've gotten a "dud" - if you can't fix it with the above suggestions (or if you're not game to tinker), drop FPR a line and they'll sort it out for you. Sorry your first experience with the pen has been less than positive! I'm surprised your pens have a smell, but maybe I shouldn't be: I've not noticed this with mine. That said, it's not uncommon for vegetal resin to have a distinctive (and not altogether pleasant) smell - it's a *very* common complaint with Noodler's pens. The smell will fade with time - though I have come across comments online about how to speed up the process (can't remember what they were, sorry!). Unfortunately my experience with EF nibs from FPR is that they are *so* fine, they often need a bit of smoothing by the end user. 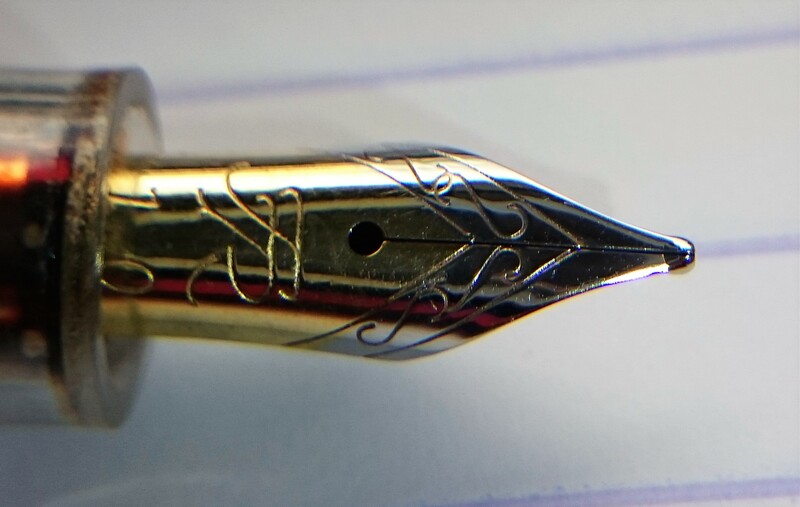 (The Guru is probably using the older stainless steel #5 nib? Their EF nibs were much better on arrival, in my experience - even though I otherwise prefer the #5.5 range). If you don't have the wherewithal to smooth out your nib, I'd drop FPR a line: their nibs *shouldn't* reach the end user in an unusable state. 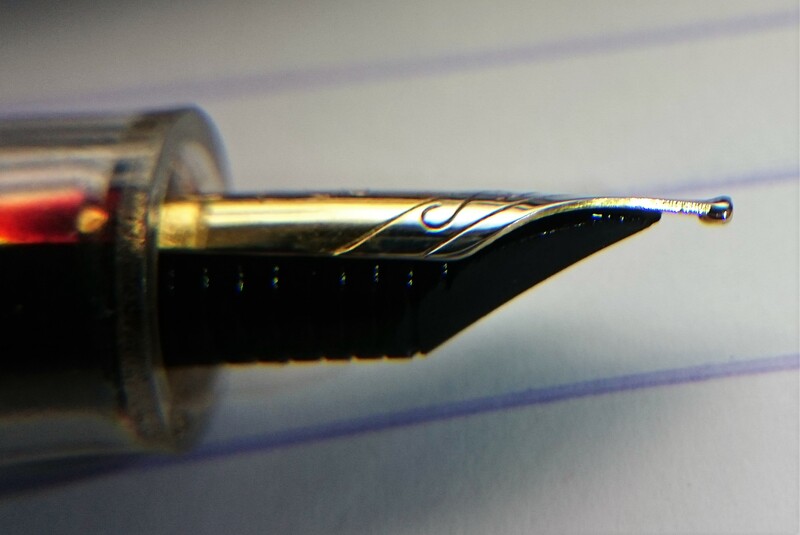 In the meantime, the Guru nib should fit in the Jaipur (size difference notwithstanding, they're designed to fit over feeds of the same diameter) - it's worth seeing if that resolves your flow problems, too. The smell will definitely fade with time - cleaning the pen thoroughly with detergent (then rinsing thoroughly) may help. Other than that, you could try a search on FPR to see what people have done to reduce the smell of their Noodler's pens? Ok, have just had a good ol' sniff - it's faint, but there is a definite smell. That's not uncommon for vegetal resin, and it *will* fade with time. Edited to add: will be on the road for the next few days - please forgive me if I'm limited in my ability to interact with this thread. Keen to hear other people's experiences with the Jaipur!  Edited by Jamerelbe, 22 September 2015 - 23:41. Interesting review. I've been a fan of FPR for qute a while now, and the FPR Triveni Jr is my favorite pen by them, but I think I might order a Jaipur and try it out. I've been using my Jaipur as my daily writer for a few days, and although I love how wet the nib is it also seems to have the downside of being quite a.. messy.. pen. After my daily commute which is not particularly hectic - 5 minutes in a car, 40 minutes in a train, then 15 minute walk, there is quite a significant amount of ink deposited inside the cap, invariably getting up into the threads and subsequently onto my fingers. My Lamy which rides right along beside it doesn't have this problem at all. Can I ask: Is yours like this, too? Perhaps I should consider re-seating the nib and feed? Yep, my two Jaipurs seem to be prone to leaking into the cap - but trying to reseat the nib and feed more firmly may help. I've been away with the family and haven't had a chance to fiddle... Will give it a try, and see what I can figure out!